During my recent week in Amsterdam I wandered through five museums; four in Amsterdam and one in de Hague. I had a vague understanding of the Dutch painters, but seeing their work up close in Dutch museums is completely breathtaking. Dutch master and Post-Impressionist painter Vincent Willem van Gogh has an entire Amsterdam museum built in 1973 devoted to his works and that of his contemporaries conveniently located a 10 minute walk from my houseboat accommodation. In 2002 thieves scaled the Van Gogh Museum wall, smashed a window, evaded the security system and stole two works of art including View of the Sea at Scheveningen, one of only two Dutch seascapes painted by Van Gogh. While the thieves were caught in 2004, the paintings were never recovered until the news broke of their recovery while I was in Amsterdam. According to Smithsonian.com the theft was linked to the Camorra crime syndicate in Naples. This wasn’t the first time a Van Gogh museum theft occurred. In 1991 twenty paintings were stolen from the museum and recovered 35 minutes later in an abandoned car. I attempted to sketch the mural side of the Van Gogh Museum when I was there and gave up feeling not at all up to the task. Returning home a quote from Van Gogh popped up on my Facebook feed; a message I wished he would have delivered in that moment of intimidation that discouraged me from pressing on with my drawing. Squeezed in among the expectant crowd on the Plaza del Ayuntamiento in Valencia, Spain, I knew I was about to watch an explosion. The 2pm Mascleta is a daily tradition of the Fallas Festival. I did not anticipate the teeth tingling, throat vibrating, ground shaking impact of over 200 pounds of gunpowder going off in what the tourist brochures describe as a “perfectly synchronized rhythmic symphony of noise finishing with a 20 second grand finale.” The March festival of Fallas is a noisy, colorful nineteen day event that begins on March 1st and ends late on the night of March 19th, St Joseph’s Feast Day, which is where the celebration has its more humble beginnings. Its an opportunity for local artists and craftspeople of to showcase their talents and that includes the pyrotechnicians responsible for Mascleta and the fireworks shows that are part of the festivities. Also the cooks who make the bunuelos, the pumpkin fritters that are a Fallas specialty; the brass band musicians and dancers and the seamstresses who create the elaborate traditional costumes seen on the streets. But the original artistic stars of Fallas are the designers, carpenters, painters, moldmakers and technicians who create and assemble life-size and larger figurines called ninots onto neighborhood platforms in scenes that depict all manner of political and satirical statements. A scene of ninots is called a fallas which is how the festival got its name and the fallas aren’t on full display until the final three days of the festival when their artistic teams have a designated window of time to fully assemble their creations. There are only a few days for the public to wander Valencia to view all 500-700 ninots before the final act of Fallas, the burning of all the ninots in a fire known as Crema which occurs on March 19th. It was in the 18th century that early versions of ninots became part of the celebration of the Feast Day of St Joseph, the patron saint of carpenters and craftsmen in the Catholic religion. Craftsmen would traditionally sweep out their shops of wood scraps accumulated over the winter on St Joseph’s Day, a symbolic end to the winter and welcoming of spring. Their large T-shaped candleholders called parots would get propped in front of buildings (or suspended as puppets between buildings) dressed as figures that represented some injustice that had occurred during the previous year. Those simple early ninots have evolved into magnificent wax and polystrene figurines that require such precise skills that the artists who create them now have their own guild, The Guild of Falleros Artists; at least two schools who specialize in training them; two museums dedicated to their work and a part of Valencia known as Cuidad del Artisto Fallera (the City of Falleros Artists) where many of them have full-time workshops. To find out more about the art of creating a fallas, begin at the Museo del Artista Fallero located in City of Falleros Artists in the quiet Benicalap district northwest of Vallencia’s historic quarter. The museum is open year round from 10AM-2PM and 4pm-7PM Monday-Friday and Saturdays from 10AM – 2PM. There is a small auditorium in the back of the main floor and if you ask the museum staff they are happy to show you the video (available in multiple languages) that traces the evolution of the process of building ninots from its humble beginnings in the 18th century to the complex craft it is today. Then wander the two story museum to see the process for yourself. There are examples of early water color and pencil sketches (the first step in the process as the ninots must be approved by the neighborhood committees who ultimately pay for their creation); scale models of the fallas, examples of the wooden skeletons on which the larger ninots are constructed and the final product including the previous year’s favorite ninot voted on by the public. The talents of the Falleros Artists are in high demand and many of them have been internationally commissioned to design movie and theatre sets, displays for industry and trade shows and other museums which are also on display in the museum. Turn left when exiting the front door of the museum and wander among the industrial buildings housing the workshops of many of the artists. I was there the first week in March and many of the workshop doors were open with artists putting the final touches on their Fallas creations. I asked permission from the working artists to go inside their workshops and take photos and though my Spanish didn’t fully appreciate the tours they gave me, their evident pride in their work and my appreciation for it crossed language barriers. One of the largest workshops belonged to Manolo Garcia whose team had been selected to create the 2016 fallas monument representing the City of Valencia displayed in the Plaza del Ayuntamiento; the one subjected to the blasts of the daily Mascleta of gunpowder explosion and traditionally he last fallas to get burned in the fire on March 19th. The scale model and the massive pieces of the scene in the workshop did not do justice to the full scale of the monument as it was being constructed. Because of its sheer size, much of the actual carpentry happened in the plaza where the public could watch its daily progress. The monument, called Fallas of the World, consisted of a tall wooden human figure surrounded by world “monuments” that had been part of previous years’ fallas structures – the EIffel Tower, the Statue of Liberty, the Concorde jet, the statues of David and Moses. Equally large and impressive fallas monuments could be found throughout the city in the neighborhoods who had commissioned them. The most impressive were lit up at night which is one of the best times to appreciate their artistic creativity. Festum Bacchas, a large scale monument showing the life cycle of the area’s wine industry cost 90,000 Euros to build and display according to a member of the neighborhood committee. The committees work all year raising money in a variety of events to pay for their fallas monuments to show their neighborhood pride in Fallas and in hopes of producing a winning monument from the judges who only have two days to see and judge the completed structures. Each committee selects one of the ninots from their fallas to display in the Exposition of the Ninots, held this year in the Prince Felipe Museum in the City of Arts and Sciences. For 38 days (in 2016 from February 5-March 15) members of the public (including tourists) can wander through the display of ninots and cast a vote for the one that should be saved from the fire. Called the Ninot Indultant, the tradition of saving one figure from the fire first became a tradition in the 1930s in response to public sentiment that something should be saved to commemorate the artistic effort of that year’s fallas artists. 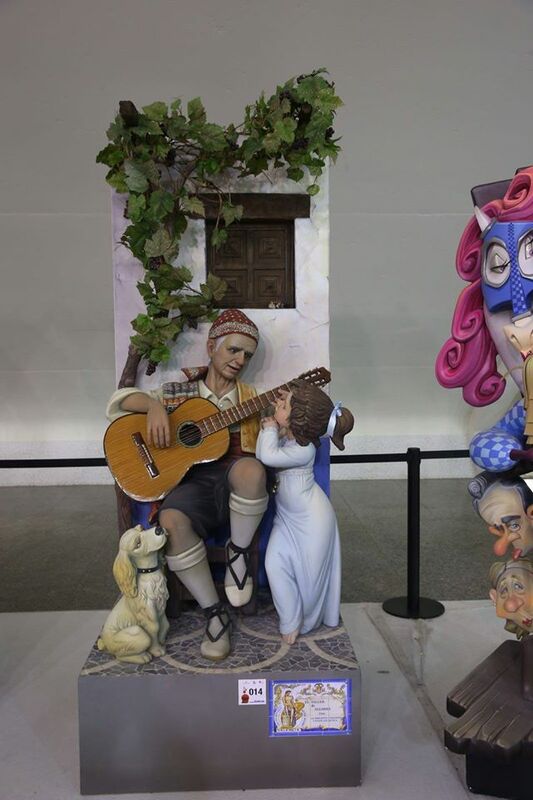 In 2016 it was a ninot from the Festum Bacchas fallas that the public voted to save; a farmer playng a guitar while a small girl and her dog listen. In addition to the Museo del Artisto Falleros, the city has a second museum open year round dedicated to Fallas called the Museo Falleros where all of the ninots indultants saved from the fire since 1934 are on display. The progression of technology and art over the years is evident in the chronology of ninots. The early ninots were wooden and paper mache figures dressed in real clothing. As the artists began to use wax, clay and cardboard, polyester and then polystrene, the ninots got more complex and the fallas monuments more extravagant. The art of the Fallas Artist Guild can be appreciated any time of the year by visiting both museums, but to see it in its full glory, it really must be seen during Fallas and in particular, in the three days leading up to March 19th. If you are not a fan of the high decibel noise of the daily Mascleta and the miniature neighborhood mascletas that seem to occur all day and much of the night in the final week, then finding accommodations outside the historic city center is advised. Bus and metro transportation run frequently and you can just wander the city’s streets where you’ll find a fallas on most street corners. Ask locals for the best fallas to see since you won’t be able to see all of them. And don’t get too attached; they all go up in flames on March 19th save one ninot indultant. By the morning of March 20th, the streets have been cleaned of burnt debris as though nothing was there. But the artists of Fallas Artist Guild are busy planning their creations for the following year.